Overlooked by Sir Basil Spence’s Sunderland Civic Centre of 1970, Mowbray Park occupies an area of Sunderland that was historically called Building Hill. Here certain local people held rights to quarrying the magnesian limestone close to the centre of town. The quarry is said to be called Building Hill because the stone was used for building purposes but the real origin seems to have been Billdon – a bill-shaped hill. In 1844, Sunderland council purchased the undulating quarry land from the Mowbray family with the assistance of a government grant. Their intention was to develop a public park for Sunderland. 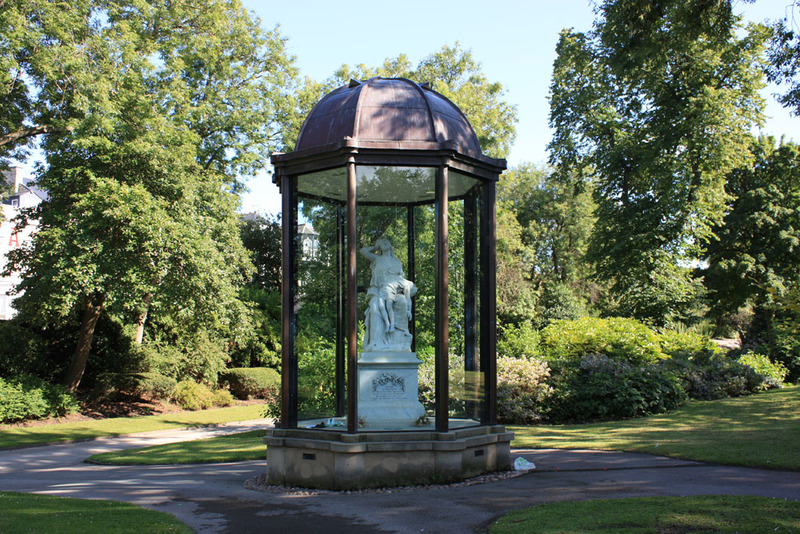 The park was opened in 1857 by the Sunderland Lord Mayor and local MP, John Candlish, who was a noted glass bottle manufacturer in the town and also owned a glassworks in Seaham. Candlish is commemorated in one of the park’s monuments. There are a number of other notable memorials in the park. The most moving is that to the Victoria Hall disaster. 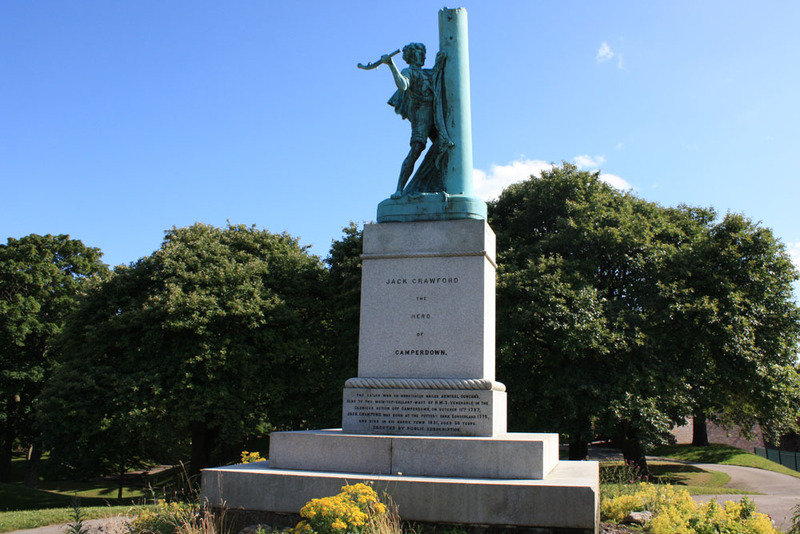 Located on the Toward Road side of the park, it stands near the site of the Victoria Hall Theatre where, tragically, on June 16, 1883, an incredible 114 boys and 69 girls died in a crushing incident caused by a door that could only be opened one way. The incident occurred during a special performance for children and the crush occurred as excited youngsters in the upper tier of the theatre rushed towards a lower tier of the theatre where performers were throwing free toys to the audience. Following the tragedy, new safety measures were introduced to public buildings across the world. The Victoria Hall theatre continued to operate until 1941 when it was destroyed by a German parachute bomb. The Indian Mutiny was an event that could have been avoided as it resulted from British insensitivity, ignorance and disrespect for Indian traditions. Havelock had no direct responsibility for this but it is debatable whether he would be so favourably looked upon as a hero by the standards of modern thinking. Close to the lake overlooked by the Winter Gardens one of the most amusing features of the park is a sculpture of a walrus reclining alongside the water with the seagulls for company. It commeorates the Lewis Carroll rhyme, the Walrus and the Carpenter which has strong associations with Sunderland. Lewis Carroll was a regular visitor to Whitburn on the northern outskirts of Sunderland. The area of High Street West facing the Minster is home to a number of notable Edwardian Baroque style buildings including the Empire Theatre of 1906 by the Sunderland architects Thomas and William Milburn. The brothers also built the former fire station nearby and the magistrates court. 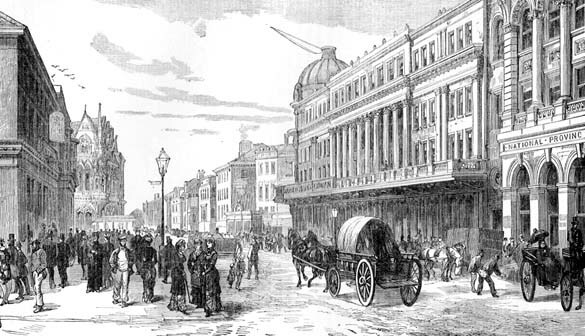 The Empire Theatre’s neighbour is the equally ornate Dun Cow pub of 1901 (by Benjamin F. Simpson) which like the theatre has a green copper dome. Of similar style is the pub called The Peacock just to the east, built 1901-02 by Hugh Hedley It was originally named The Londonderry after the County Durham coal owner, the Marquess of Londonderry but was refurbished and renamed in 2017. The Peacock was the name of an earlier pub that had stood on this site. The year 2017 also saw the transformation of the Edwardian Old Fire Station into a wonderful new music, culture, dance, drama and arts hub which also includes the Engine Room restaurant. The Peacock pub and magistrates court overlook the recently created Keel Square (2015) with its water fountains. The square has an extraordinary lengthy line of paving called the Keel Line with an inscribed year-by-year timeline featuring the names of all the Sunderland-built ships. The two main streets of Bishopwearmouth in Sunderland city centre are High Street West and Fawcett Street. The High Street West is part of a mile long street following a centuries old routeway that begins near Sunderland Minster and continues east into the port area of ‘Old Sunderland’, where it is called High Street East. The High Street was historically called ‘the Lonnin’ and part of the route, through the former open land between Bishopwearmouth and Old Sunderland was also called ‘Wearmouth Walk’. By the time the first Wearmouth Bridge opened in the 1790s, the whole of the street was colonised by buildings joining the two places together. The opening of the first Wearmouth Bridge stimulated further growth including a new major street that was built in Sunderland adjoining the High Street and leading south from it. This was Fawcett Street, built on land belonging to a local landowner called Christopher Fawcett around 1814. Initially residential it had developed into Sunderland’s major commercial thorougfare by the late 19th century. There are several notable buildings in this street leading south towards the Civic Centre and Mowbray Park. Historically, the old part of Bishopwearmouth was a village focused around Wearmouth Green and the Sunderland Minster which was formerly the church of St Michael and All Angels. It was in this area of Sunderland that a number of old routeways into the town converged. South Wearmouth, as Bishopwearmouth was originally called, came into being in Anglo-Saxon times when it encompassed lands stretching south as far as Seaham and Hesleden. The lands were given to the Community of St Cuthbert at Chester-le-Street around 830-846AD. The lands were then seized in 918 AD by the Dublin-based Viking ruler, Ragnald who gave them to his follower, Olaf Ball. They were later returned to the Bishops of Chester-le-Street (predecessors of the Bishops of Durham) by Athelstan, King of England in 934AD. Athelstan described the lands as “my beloved vill of South Wearmouth” Through its association with the Bishops of Durham, South Wearmouth became ‘Bishopwearmouth’. Bishopwearmouth was a rather sleepy rural settlement at the time of the Boldon Book (1183) and retained its village-like appearance for centuries. You still get that feel today south of Sunderland Minster where the church still overlooks the village green. The green is bordered by neat cottage-like buildings in Church Lane and the rustic looking Mowbray Almshouses of 1863. The almshouses were originally founded in 1727 when Jane Gibson, widow of a Sunderland merchant made a bequest for “an hospital or almshouse, erected and endowed for the maintenance of 12 poor men or women”. The fund for the almshouses was administered by a notable Sunderland family called the Mowbrays, who rebuilt the almshouses in 1863. The green itself has long been common land and in less enlightened times was used as a venue for bull baiting.